-Up to 14 days before departure: refund of 100% of the tickets. -Up to 7 days before departure: 75% of the value of the tickets. -Up to 12 hours before departure: 50% refund of the fare. -Cancellations made less than 12 hours prior to departure NOT entitled to a refund. Passengers and Vehicles must report at the embarkation port for check-in at least 1 hour before departure. The ticket is strictly personal. It is not transferable and is valid only for the specific accommodation and the route for which it was issued. 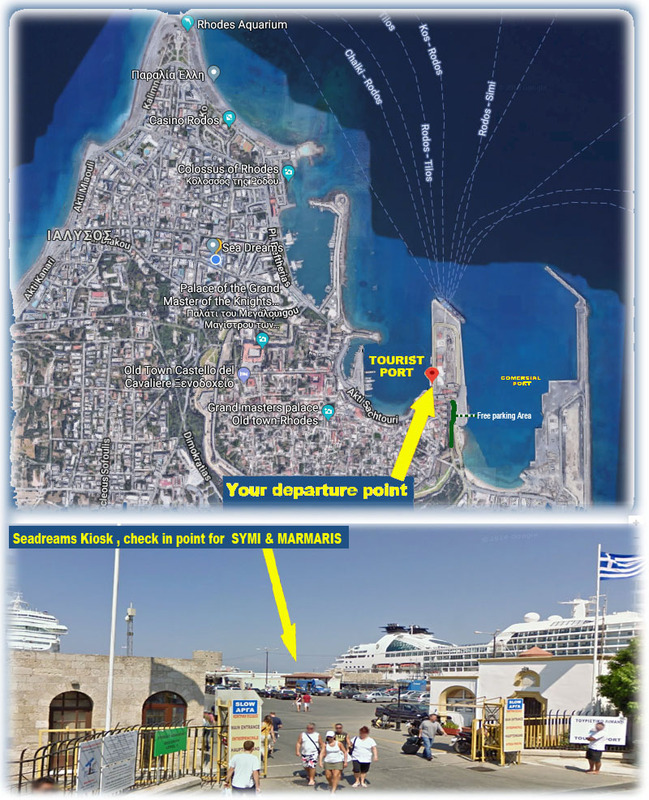 This website, http://www.seadreams.gr/, here in after called Website, has been created and is property of the company under the name Naval Agean Company distinctive title SEADREAMS (hereinafter SEADREAMS) established and operating pursuant to Greek Law, based in Gialos Symi with branch in Grigoris Lambrakis 46 in Rhodes with VAT number 097 795 290 /: DOY RHODES and exploit tourist boats between Rhodes and Marmaris Turkey as well as other islands in Greece. The SEADREAMS is sole owner, otherwise beneficiary, content Introduction to the Website, having secured the necessary permission to use the information display to it from their alleged respective licensors. Collecting information on tourist goods such as maritime transport services to / from a variety of destinations (eg to Symi to Marmaris in Turkey), and to the availability of these tickets. Take Transfer services (for instance, transportation by tourist buses from ports to hotels and vice versa for the other destinations, etc.). Processing of your data by Seadreams is based on the Law on Legal Protection of Personal Data of the Republic of Lithuania and your voluntary consent. All users are open to visit the website according to its intended use. The use of further service such as the booking of services does not require prior registration. For booking services via the website, the General Terms of Business of Seadreams and Suppliers of Tours and other touristic Services as well as the additional conditions of individual suppliers, which you can find at the service pages, shall apply. Seadreams strive to keep the website up to date. Notwithstanding, Seadreams does not accept liability for the correctness and timeliness of the information displayed on the website. You are using or refraining from the use of this information at your own responsibility. Seadreams excludes liability for accessing or using this website including all the therein contained information and data. Seadreams does not accept liability for damages caused by computer viruses, spyware and other malicious computer programs. The entire content of this Internet platform is protected by copyright. Names, titles, logos, texts, pictures, designs, and so on, may not be copied, modified, transferred, reproduced, and so on, for any commercial or non-personal purposes. If you wish to use texts, pictures, and so on, you can get in touch with Seadreams who will refer you to the owners of the respective copyrights. When you book on the website, you are transferring personal data such as name, address, date of birth, phone number, e-mail address and information about booked services, to us. This data will be stored by us for providing our services. When you pay for your booked services, the credit card payment will be processed by payment solution provider. Seadreams does not store credit card information. You can specify in your browser software how your computer is to accept cookies. If you disable cookies in your browser software, you can still visit our website. However, it is possible that certain functions cannot be used to the same extent or that your visit will not be as convenient. - You always have the option to delete cookies from your hard drive. - If you disable or delete cookies from your hard drive, you prevent that certain data about your use of the website be transmitted to Google. You can find full details of how to manage and/or opt-out from cookies on different types of web browser on www.aboutcookies.org. Thanks to the Google Maps API Seadreams can provide you with additional information. To this end, certain anonymous data can be transmitted to Google. When you complete a booking (conclusion of the contract), a part of your data will be transmitted to the booked company so it can properly provide its services. This company can be located outside of the European Union and may apply its local legal provisions on privacy protection. In that case, we cannot guarantee that the data will be protected in accordance with EU laws and regulations. Under certain circumstances Seadreams and/or the booked company are obliged to pass on or make certain information available to authorities. Some data is transmitted to Google, as outlined in section 5. In case of a booking and payment thereof, the necessary data for payment processing will be provided to an external payment provider. Seadreams reserves the right to pass on information to third parties, authorities, and so on, if it is necessary to ward off claims and demands of all kinds. If you book a service from Seadreams, you give us permission to send you relevant messages and documents online. The company who provides the service also has the right to send you messages. For details, please see the general contract terms. We try to ensure that our website offers visitors what they are looking for. In order to achieve this goal, we may use your data for analytical purposes, for quality improvement, for service development, to improve the performance of the website, to measure the success of our advertising campaigns or to tailor services to your queries. For these purposes we may transfer your non-personally identifiable information such as, but not limited to, anonymous demographic information, online behavior to our contracted partners. No such data will be disclosed to third parties except in aggregate, non-personally identifiable form. By subscribing for newsletters you expressly consent - being aware of the adequate information on the data processing - to receive direct marketing communications including direct marketing or special offers of Seadreams or of our contracted partners. For the purposes of sending you such direct marketing communications/special offers, we will process your following personal data: name, e-mail address. Such consent is voluntary. You can unsubscribe any time without giving any reasoning, free of charge via the link provided in each newsletter.